Hello! I'm the quiet type!...yeah, right...NOT really! Ha! Sometimes we (family and friends) might LIST things here in THIS Booth, as my other Booth Divine Fabrics N More has Mostly Fabrics or Paper Crafts. The Bonanza Community is a Wonderful One! Meanwhile Happy Selling and Joyful Buying to Each of You! BonBonAnonz doesn't have any items in their booth! Thank you for adding my Victorian Jewelry to the hand picked list! BonBonAnonz is just a great person to do transactions with! Very pleasant lady! What a gem! Great booth!! I love this seller not only becacuse she’s a very special friend, but she’s also an awesome seller. I’ve purchased from Dee many times at her other booth and was tickled to see she had opened a second one. Her fabrics are amazing and she is a true saleswoman in that she takes care of her customers. She’ll set up special listings, she is a great communicator, she ships fast and her fabrics are packaged very nicely, not just thrown in the box. So, stop by and say Hi to Dee, you won’t be sorry you did. 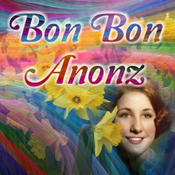 Bon Bon Anonz is an amazing seller, ships super fast and has unbeatable prices I purchased from her and I will be a returning customer!